Play or 'wrestling' is the most common social interaction of hoary marmots and occurs most frequently among young, yearlings, and 2–year–olds. The largest members of the squirrel family (Sciuridae) in North America, adult hoary marmots weigh 10 pounds (4.5 kg) or more and may exceed 30 inches (76 cm) in total length. The animal attains their maximum weight in late summer, when they accumulate thick layers of fat that will sustain them through winter hibernation. Body shape is similar to the Alaska marmot with their head short and broad, legs short, ears small and round, body thickset, tail densely furred, and front paws clawed for digging burrows. Hoary marmots are predominantly gray with a darker lower back and face and a dark, reddish tail. The hoary marmot has a white patch above its nose and usually has dark brown feet, resulting in the Latin name caligata, meaning “booted.” The pelage color of marmots is adapted to help them blend with the lichen-colored rocks or rusty-brown soil of their surroundings. Marmot coloration varies, and there is a small population of black marmots – melanistic marmots – in Glacier Bay (and in the Tetons of Wyoming as well). True hibernators, marmots enter a state of torpor in winter during which body temperature and all bodily functions are reduced. Hoary marmots hibernate alone in the same burrows in which they spent the summer. Marmots are most active in early morning and late afternoon, although they may leave their burrows during other daylight hours. 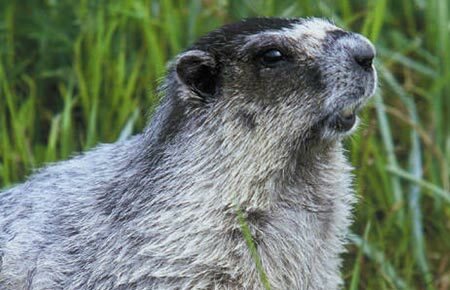 Marmots need wind to control mosquito levels and rarely venture out on calm days. The Hoary marmot marks its territory by rubbing its face and glands on rocks and along trails. 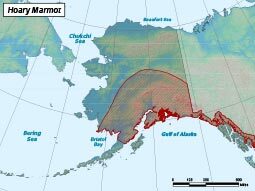 In Alaska, all marmots mate in April or May. Hoary marmots will not disperse in their first year and are not sexually mature until two or three years of age. Marmots utilize a facultative mating system, being either monogamous or polygamous. Pairs may remain monogamous for one or more years, and subsequently switch to a polygamous mating system. Mating systems may reflect resource availability, habitat quality, or male fitness at the local level. Males mate with one or more females living in their territory, once per year, usually in early spring while still in the den. Litter size is three to eight and offspring are born in late spring to early summer. Female marmots give birth in an underground, excavated den after a gestation period of roughly five weeks. Pups are born naked, toothless, and helpless with their eyes closed. Around six weeks of age, the young have dense, soft fur, and are independent enough to explore outside the den. Offspring live and hibernate with parents for two years before dispersing. The Hoary marmot is a diurnal herbivore and feeds on grasses, flowering plants, berries, roots, mosses, and lichen. Hoary marmots show selective foraging behavior, feeding first on favorite plants rather than ones that may be more abundant. Hoary marmots hibernate alone in the same burrows in which they spent the summer. To protect themselves from the cold, they plug the tunnel leading to the nest chamber with a mixture of dirt, vegetation, and feces. They emerge from their winter hibernation in April or early May to find food and mates. Body size of the marmot fluctuates during the year because of hibernation. A marmot leaves its winter sleep very thin but quickly gains weight, with fat stored for hibernation making up 20 percent of its body weight at the end of summer. The hoary marmot is found in alpine areas across most of Alaska south of the Yukon River and occurs down to sea level along areas of the coast where suitable habitat exists. Hoary marmots den in talus slopes, boulder fields, and rock outcrop, burrowing into the soil under rocks. Dens are often located near an observation post such as a tall rock, berm or cliff edge. Most marmot dens have a main entrance with a mound of dirt near the hole and a number of concealed entrances, entrances are often lined with grass. Rocks must be large enough and accumulated to a depth sufficient to give subsurface protection, as predators such as wolves, bears and coyotes will dig out marmots if they can. Marmota caligata maintains a stable population trend. Common predators include wolverines, wolves, bears and raptors. Eagles are principal predators of juveniles. Mating occurs once per year in early spring. Females give birth to litters of 3-8 young in late spring to early summer after a 5 week gestation period.